Friday is here. That means another installment of Girl in The Woods, a regular 2016 feature on Vampire Maman. If you’re one of the of the two people reading Girl in The Woods congratulations. If you’re new to all of this please go to the Girl in The Woods page (CLICK HERE) and read the previous installments of this SERIAL NOVEL. It is an epic romance, adventure, fairy tale, you-name-it kind of story. OK here we go. The next two weeks went by as a blur of parties and social functions. In two weeks Alexander’s busy work schedule usually meant the kiss of death for any prospective brides but King Florien made sure that was not the case this time. Constant press coverage was something Alexander had grown up with but he had never seen anything like it was now. The constant requests for interviews and front page stories were, well, embarrassing. Even when he had been engaged to Viola the press hadn’t been this bad. Then again, the engagement with Viola had come on more quietly. He’d actually fallen in love with a woman who had been his friend and equal. He wasn’t sure what Candi was. Beautiful, musically gifted, well connected politically and…he couldn’t imagine being married to her. He could imagine waking up with her in the morning, curled up naked next to him, but when he imagined her speaking it all was a blur. She was as darling and cute as the small dogs she adored. Her musical talent was a true gift. He liked music and parties, but aside from that they had nothing in common. Most couples grew together and built a life together, so he figured they’d build on a clean foundation unencumbered by any preconceived conflicts. It would be a perfect match. And God knows they’d always look good together. In the meantime Alexander’s tight knit group of his closest friends were all putting the pressure on to meet Candi. Princess Kitty had done her best to separate the happy couple from Alexander’s established circle. After the wedding he’d have the pleasure of banishing Kitti back to her home in The Lavender Forest. The day of Alexander’s party had started as any other day with a hike in the woods to wake him up and clear his head for the day. He’d gone to the ruins of the old North Castle to watch the sunrise. He’d stood at the top of the hill letting the cold wind blow some sense into him. In the distance he saw a rider leaving the ruins of the old Fern Chapel. It was odd, especially this time of year few people came up here and so early in the morning. It was a woman on a magnificent black and white horse. The horse was going at a brisk walk, and then started off to a full gallop through the trees. He made his way on foot down the hill to the chapel. The roof was long gone. White and purple crocus lined the old stone path to the building. Behind the pond showed the first signs of spring in the new growth on ferns and reeds. The ferns were lush and inviting in the summer, comforting to him in the colder weather. On an ancient stone bench someone had left a small leather bound volume. A flash on the ground caught his eye. Sparkling in the winter sun was a moss green jewel surrounded by gold. “The lady lost her earring.” He thought as he picked it up. It was delicately set on a tiny fern leaf crafted with exquisite beauty. He picked up the book. The leather was still warm from the reader’s hands. It was the third volume of the love poems of Jeffery Shadowford, Alexander’s grandfather. When his mother fled the Crystal Mountains she had managed to bring the set. The set was rare, only 50 copies were made, fewer survived. Alexander had been trying to locate any volume since he was 16.
Who is this woman he wondered? The book alone was an amazing find but paired with the fern shaped earring. From the book he pulled a slip of paper. He recognized the buttery cream colored paper stock as the same he used for his own letterhead. A sketch of the fern pond was on one side. Details of new fern fronds were carefully drawn in life like detail on the edges and labeled by their botanical names. The artist had real talent. A slashing mark scrawled over the words as if the writer had been frustrated by her attempts of poetry. Symbols were drawn under the words. It appeared to be wizardry but he couldn’t be sure. This wasn’t his area of expertise. Underneath was more writing in a foreign language. It looked like Starling. He didn’t know the language well but he recognized it from some old books in his collection. Aside from his mother he didn’t know anyone who knew the language, much less Starlings. The page was wet with what looked like rain. Maybe something splashed in the pond. The day was crystal clear. Tears, he realized. The page was wet with tears. He looked at the script reading the words. I will never find him. Who was she, the woman riding into the woods? What was the man she would never find? When he looked through the book he found no poetry that started with the lines two by love, two by faith. Someone had broken her heart, or maybe she was searching. He’d long given up searching for real love. The thought made him feel empty. Turning the earring over in his hand, as he wondered who it belonged to. It would be easy to spend the rest of his life with Candi. She was beautiful and perfect but what if the owner of the earring was the woman he was meant to be with? Who was he kidding? He’d been meeting women for 20 years without finding the perfect woman. “I will never find you”, he said out loud and headed back up to his house. Alexander walked the back trail through the woods to the Royal Palace. His cat Rufus followed for as far as the old gate, about half way then turned around. Going through the back entrance of the palace he flirted and gossiped a little with the women on the kitchen staff. It was a lovely ritual he’d started as a teen. From there he went to his mother’s studio. His father was there looking at her most recent painting. She glared at her son and slipped out of her coat, then threw it over a chair. As always he was amazed at her presence and beauty. “That is of your own doing, but since I’m not of a species that eats it’s young, I still love you more than anything in the entire world.” She smiled and gave her eldest child a kiss on his cheek. She remembered when he was a small child and how sweet and soft his little cheeks were for her to kiss. He’d grown up so well. “King Florien wants me to propose to Candi tonight. That was an order by the supreme ruler, not a request from my dad.” He always used his father’s formal title when he was annoyed by him. She held the book. Her eyes brimmed with tears. “Alexander, where did you get this? This is my father’s book.” She’d never seen another copy outside of the Crystal Mountains. “I know, I know. This morning I found it on the bench in the old fern chapel. I saw a woman on a horse. I’m sure she’s the one who left it there. He handed her the earring. I found this too.” He handed her the earring with the fern pattern and green stones. Hyacinths beautiful face took on an ashen look. “The beautiful flowing handwriting looked familiar to Hyacinth. It was a distant memory of her past she couldn’t quite remember. “Two by love, two by faith. Do you know what it means? Mom?” he shook her out of her thoughts. From her past. He thought. Alexander had seen his mother go back to the nightmare again and again. She hid it well from his father Florien and his siblings, but she never fooled Alexander. She pointed to the symbols on the paper. “This is the Baron’s mark. The baron was a horrible cruel man. But it could be any wizard who is related to him or follows his magic. His son Robbie inherited his magic, see that’s his mark there. Robbie was twisted beyond anything you could ever imagine and his brother Doran was worse than evil.” She stared off into the distance, lost in her own dark thoughts. “I know. They’re all dead now. They can’t hurt anyone else.” He put his hand on her shoulder. He’d seen her like this on rare occasions. Memories from her past still haunted her. She squinted. “You have a good eye. It is Starling. 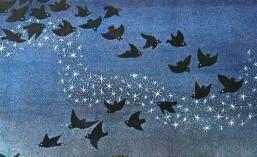 Starlings don’t live in the world of magic. They don’t understand it and it doesn’t work on them. How odd that she would write it this way. It’s been years since I’ve seen anything like this. It might be a letter or the start of a poem. Our children will be my heart and you will be my soul. But it doesn’t matter, I will never find you. Hyacinth stared at the paper. The woman was from the Crystal Mountains or perhaps an off chance she was from the Moonbeam Mountains or the Northern Wastes. The style of writing, the vow of love. Who could it be? There were a few from that area around or those with parents from the Crystal Mountains but not many. Most lived in Meadow Creek with ties to Universal Technologies. The earring was expensive. She thought of Jonathan Snowhawk’s powerful eccentric daughter, the one Simon was in business with. No, it would be too outrageous. Her son’s voice snapped her out of her thoughts. “She is looking for someone. Do you think she’s looking for me?” asked Alexander with a new urgency in his voice. “No it would just bring up sad memories about him. You know how he gets when his friends bring up the subject of enchantments. Anyway, you can’t just start asking about who is enchanted. That is confidential information, as any medical condition or mental illness. Jasper, Ellie and Darious have all been to court numerous times because they won’t divulge information enchanted individuals. “It’s our secret.” The secrets with his family were growing thicker every day. “If you do find the girl with the earring, your own girl in the woods, she’ll be your own real princess.” She whispered. She put her arms around her son again and held him tight. “Child of my heart and soul”. She said to him in her native language. “Heart and soul” he said back, in secret words never shared with anyone but his mother. For previous chapters CLICK HERE. This entry was posted in Fairy Tale, Fiction, Girl in the Woods, Romance, Serial Novel and tagged fairy tale, fiction, Girl in the Woods, Juliette Kings, mystery, romance, Serial Novel. Bookmark the permalink. ← Ask Juliette: Cheating Spouses, Kids, Dating and Vampires. Your feelings might just be right. Keep reading. More to come next week!